Rinca is a rough and tumble little island located in East Nusa Tenggara, Indonesia just off the western tip of Flores. One of only a very few places to spot Komodo dragons in the wild, Rinca is often overlooked by tourists on their way to the more-popular Komodo Island. You are much more likely to spot Komodo dragons in their natural habitat on Rinca Island where there is less impact from tourism. Some weighing in at 300 pounds, Komodo dragons can grow up to 10 feet long, are venomous, and have caused several human fatalities. Komodo dragons are the largest lizards on Earth, but don't let their size fool you; Komodos can chase down prey - usually a hapless water buffalo - at 15 miles per hour! Rinca briefly made the world spotlight when five scuba divers were found stranded there in 2008. The group survived on shellfish and had to fend off the dragons by throwing rocks and dive weights. Rinca is a part of Indonesia's Komodo National Park and has been granted UNESCO World Heritage status. 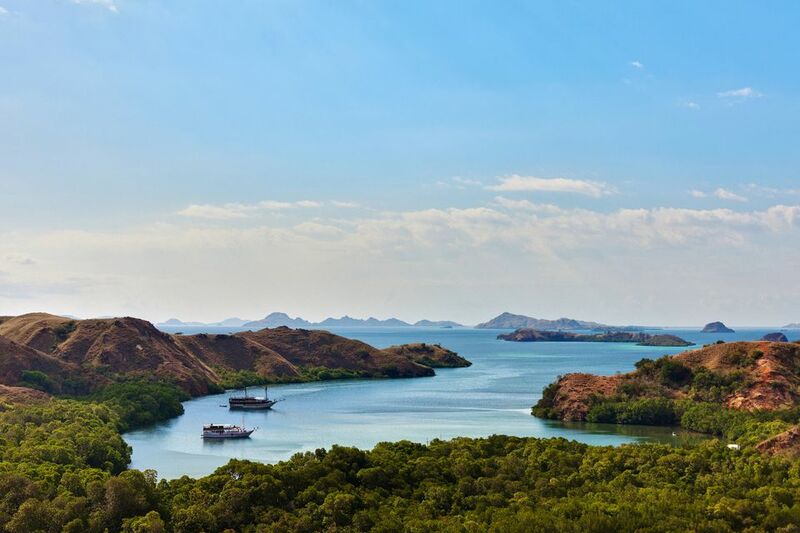 If you find yourself in search of the famed Komodo dragon, avoid the crowds on Komodo and visit Rinca instead! Rinca occupies only 123 square miles and aside from a tiny fishing village, the island is completely undeveloped. Miserably hot and usually dry, Rinca is the perfect home for exotic and dangerous wildlife. Dense forest gives way to grassy fields and a few scattered watering holes where the Komodo dragons hunt for prey. Far fewer tourists visit Rinca than the neighboring Komodo Island. Although never a guarantee, the chances of spotting dragons in the wild is much better on Rina than on Komodo. With a little luck, you may find only yourself and a guide - armed only with a stick - wandering the bush in search of Komodo dragons. When arriving at the dock, a short walk takes you to the ranger camp where you will be required to pay a fee (around $15) which includes a guide for one to two hours. Two hours is all that you will be able to handle in the extreme heat. It is not possible to explore the island without a guide . A few lazy Komodo dragons can be spotted right away lounging around the camp waiting for handouts or rummaging through the garbage. Take photos, but do not approach the dragons - they can run nearly twice as fast as you can! The island is very hot; use sunscreen and take more water than you think necessary. Read more about sun protection in Southeast Asia. A small canteen at the camp has drinks and snacks, but no food. If a large group has formed, simply tell the rangers that you want to wait for the next guide. Your chances of spotting Komodos are much better in a small group. Stay close to your guide and watch carefully when walking through tall grass for Komodos hiding in ambush. Depending on the success of the trek, some people choose to tip their guides or offer to buy them a cold drink. Members of the monitor family, Komodo dragons are the largest and most lethal lizards on earth. Adults regularly live up to 50 years and reach more than 10 feet in length. Only in 2009 did researchers discover that the dragons are venomous; it was previously thought that the high level of bacteria in the mouth was the primary cause of deaths after a bite. Biologists estimate that less than 5,000 Komodo Dragons exist in the wild; around 1,300 are thought to live on Rinca Island. Komodo Dragons are known to exist only in five places in Indonesia: Gili Motang, Gili Dasami, Komodo, Rinca, and in Flores. Read more about Komodo Dragons. Indonesia's Komodo National Park claims some of the best diving in the world for those brave enough to face the strong currents. Deep ocean currents coming from Antarctica pour into the Indian Ocean creating dangerous and unpredictable currents. A staggering array of marine life comes to feed on fish and organisms brought in by the currents. In 1991 the Komodo National Park was named a UNESCO World Heritage Site to protect the fragile environment and endangered Komodo dragon population. A 3-day pass to the park costs USD $15 and is required to visit Rinca Island or dive in the national park. Read more about the Komodo National Park. Komodo dragons aren't the only impressive wildlife on the island. Some of the life on Rinca includes water buffalo, deer, wild pigs, monkeys, and many exotic bird species. Cobra snakes - responsible for more fatalities than the dragons - are frequently spotted at night or swimming in the water. Read more about monkey safety. As with Komodo, Rinca can be accessed either via Bima on the island of Sumbawa or Labuan Bajo on the western tip of Flores, Indonesia. Flights are available to both from Denpasar in Bali. Once in Labuan Bajo, you must arrange for a boat to Rinca Island. This can be done for a fee through your hotel or by going to the dock and speaking to a captain yourself. Most of the boatmen speak very little English, so choose carefully. A chartered boat for the day can be negotiated for around USD $40. Read more about Labuan Bajo. Keep in mind that you will be literally crossing some of the most dangerous currents in the world; try to find a boat with safety equipment and a radio! Rinca is best visited between April and November. Mating season for the Komodo dragons is during July and August; the females will be guarding eggs on their nests in September. The camp has a small bungalow operation, but no longer accepts guests. It may be possible to sleep on your chartered boat and return to Labuan Bajo in the morning. For obvious reasons, there is no camping available on the island.